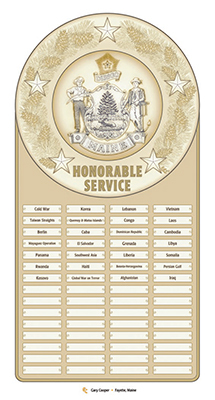 During the 125th Maine State Legislative Session a Resolve (Chapter 163) was passed to create an honorable service plaque to be displayed in the Hall of Flags in the State House to honor veterans of the State who have participated in military campaigns and operations and who are not honored by existing plaques. Thank you for helping us to construct this plaque so we can ensure all of Maine's veterans receive the recognition they so deserve. Below is an Adobe pdf document listing the Military Operations and dates. This document requires your computer to have Adobe Acrobat Reader installed in order to open the file. A free copy of the Adobe Acrobat Reader may be obtained by clicking Adobe Acrobat Reader.